Take your Spanish to the next level! Over a 1000 Spanish words for you to study Spanish language . Get Spanish B1 quickly and easily using our Spanish vocabulary flashcards and move from beginner to intermediate! Use it if you simply want to go to Spain or pass DELE B1 exam and achieve your goal! A course to take you from Spanish level non-existent all the way to B1! Discover our Spanish vocabulary flashcards and learn over a 1000 Spanish words with ease. Master Spanish B1 even if you are a beginner. Memorize Spanish nouns, verbs and adjectives better using our picture associations and pronounce the words correctly thanks to an MP3 recording. 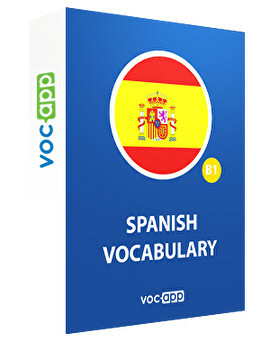 Get Spanish B1 vocabulary quickly with VocApp! We created a list of Spanish words so that you could easily achieve Spanish B1 and start speaking like a native! Our B1 Spanish vocabulary flashcards are divided into lists by topic to help you get ready for your upcoming travels or understand your Spanish colleagues and feel confident at all times!